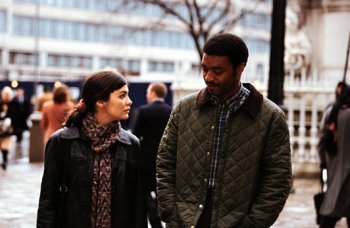 I recently took a look at the brand new Blu-ray release of the Oscar-nominated (Best Original Screenplay, Steven Knight) 2002 thriller Dirty Pretty Things. This isn’t the only film directed by the great British director Stephen Frears to kind of fall through the cracks. Other underrated Frears’ films include The Grifters (1990), for which he was nominated for Best Director, and High Fidelity (2000). The story centers on two immigrants—a Nigerian man and a Turkish woman—living in London and working at the same hotel. The woman, Senay (Audrey Tautou), is a maid who is under investigation by the immigration authorities. The man, Okwe (Chiwetel Ejiofor), drives a cab when not attending the hotel’s front desk. Okwe makes a shockingly disturbing discovery while unclogging a toilet in one of the hotel’s rooms: a human heart. His medical background, coupled with a strong ethical sense, compels him to investigate further—even at his own obvious peril, as he has no legal status in England. The Blu-ray has a pretty solid commentary track by Frears and a short ‘making of’ featurette. The picture and sound are both good, so if you missed it, there’s no better time to pick this one up.